At DarklingX we are determined to push computer graphics and data visualization in new and interesting directions. DarklingX was originally founded in 1995 under the name Darkling Simulations as a computer graphics and visualization company. We developed one of the very first node-based procedural texture editors Darktree Textures, which won a prestigious Game Developer Front Line Award in 1999. 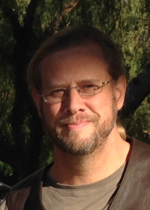 August Swanson co-founded Darkling Simulations. Previously he was a Diagnostic Engineer, technical team leader, and member of the CPU Architecture committee at Amdahl Corporation, where he worked for 6 years. August graduated from the University of New Mexico with a BS in Computer Engineering. August's interests include software architecture and programming languages. August studies different languages to understand their capabilities and best uses, and software design and methodology to write efficient, reusable code. The result is improved productivity (good for us *and* good for you, our clients) and more stable, capable, and updatable applications. Skyler Swanson co-founded Darkling Simulations. Prior to starting the company, he developed software for atmospheric simulation and 3D scientific visualization on SGI workstations at YSA Corporation. Skyler graduated from the University of New Mexico with a BS in Computer Science and a minor in Mathematics. Skyler's focus is the visualization of information and computer human interaction. He believes that human capabilities can be greatly extended by computers and that this may be necessary to advance understanding and science. The world is becoming so complex and science so strange that it is often beyond human experience. Computer visualization can help us understand past what the mind alone can comprehend. Jane Lin first worked as a software engineer with Darkling Simulations before taking over finances, project management, and business development. Previously she developed educational software for K-12 at Sunburst Communications and was a web programmer for DigitalFacades Corp. Jane graduated from Stanford University with a BS in Computer Science and BA in English. She also has an MFA in poetry writing from New York University and has taught creative writing at UNM-Los Alamos.